You might have learned about some of the beautiful and best airports in the world but at the same time, there are some of the dangerous airports in the world as well. If you would be looking around inside the world you would be finding so many airports in the world who are marked with the title of being too much dangerous. Now the main question that hit so many minds that about which airports we are talking about. Hence there are so many dangerous airports in the world who are dangerous because of their landing styles, the small size of airport flight landing road and related with the area location in which they are situated. Without wasting any time, below we would be mentioned in the list of some of the top famous and most dangerous airports in the world. Get ready to catch the dangerous flight landing! 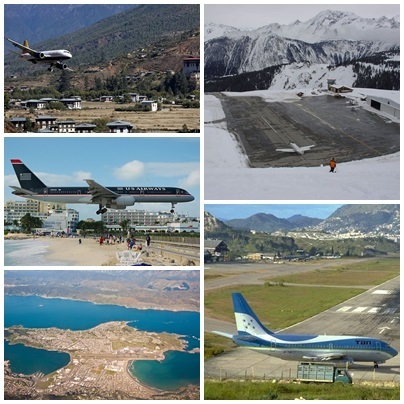 So have a look at the details of most dangerous airports in the world with pictures below. This airport is known out to be the World’s Shortest Commercial Airport Runway. This airport is located at the distance of about 28 miles south of St. Maarten. The airport is about 400 meters (1300 feet) in total length. If you would watch the plane landing in this airport you would surely be going to cry out with terror because it is so fearful and incredible. This makes it one of the most dangerous looking airports in the whole world! On the 9th spot, we would add the name of Qambio Bamda Airport that is located in the place of China. This airport has been located at the altitude height of about 4334 meters. It has been included with the runway that is about 5.5 kilometers. Toncontin International Airport, Honduras is the next on our list that is known out to be the second most dangerous airports in the mountain areas. Once you would travel in it you will never even want to travel in it in dreams. Never take a risk to travel on this airport aircraft at all! Princess Juliana International Airport, St. Maarten is still used even though it has been named out to be the most dangerous ones. This airport is considered to be the busiest airports in the world. It is located next to the side of the beach area that makes it beautiful. As at one side, it is amazing to view it but on the other side, it is yet dangerous and scary looking too. On number 6th, we have Courchevel International airport in France. Basically, it is a dangerous airport or ski resort in France. Secondly, it has a small runway. Thirdly, Courchevel International Airport has no advanced procedure of landing planes. The main reason that it is the most dangerous airport because it has a difficult and dangerous approach. This airport is known out to be dangerous for the reason that it has always undergone with the sloppy form of the landing of the aircraft. This airport can just be used by the aircraft that are small in size and can accompany 20 passengers only. So are you ready to travel through this airport? This airport is also located in the mountain areas. It is all covered with the mountains so the pilot is left with the just small path of the direction to land the aircraft. It is so scary looking! Agatti Aerodrome, Lakshadweep, India is standing 3rd on our list! This airport has been located in the area of about 4000 feet that do raise up the risk factors as well. It might look beautiful in appearance because it is quite a lot designed in unique form but in reality, it is quite a lot scary and much dangerous to travel through it. Ice Runway in Antarctica is the coldest spot on the planet that made it turn out to be the most dangerous airports in the world. Under the plane, you would witness the long stretch of manicured snow and ice. The dangerous thing about this airport is the weight of the aircraft that would be landing according to the runway. On the last and top on our list, we have Kansai International Airport, Japan! This airport has been all surrounded by the rivers and mountains that increase the greater chances of facing the earthquakes and cyclones in this airport. So here was the complete list of the famous and top 10 most dangerous airports in the world. Well, looking at the description it would not be wrong to say that all the airports are too much dangerous and risky to fly on. You can never trust that when the pilots of the plane would make your flight as the last flight of your life. We hope that this post would have come across much information for you and would stay careful while booking your Tickets! Do you want to travel through these airplane airports? So if you are an adventurous person and wants to see dangerous airports in this world then check out and visit their airports. You will surely make your trip more adventurous and thrilling.